When the lifts close in North America, snow skiing in Chile begins. In fact, a Chilean ski vacation is ideal for anyone who wants to explore a different culture while enjoying a ski vacation. Snow skiing in Chile usually begins in June and ends in October. Temperatures, which average 20 degrees Fahrenheit, are usually colder in June and July. September and October may be warmer, but snow conditions may be less than optimal. Some Chilean resorts have special "Kids Stay Free" weeks. Be advised, however, that the resorts will be very crowed during those periods. Chile's public schools have a two-week break in mid-July. This is also a crowded period at Chilean resorts. Avid American snow sport enthusiasts experience culture shock when they visit Chilean ski resorts. While the resorts are open from 9:00 A.M. to 5:00 P.M., people rarely start skiing till 10:30 A.M. Lunches at Chilean ski resorts are long, leisurely affairs. South Americans rarely eat dinner before 10:00 P.M. They enjoy partying until the wee hours of the morning, which may explain their late morning arrival at the lifts. The partying and social aspects of the sport, however, are essential to the Chilean snow skiing experience. People of all nationalities often visit the same resort each year, in order to hook up with friends made during previous ski vacations. The Chilean ski resorts appeal to families and singles. Chile has four major ski resorts. Each has its unique character, ambiance and terrain features. El Colorado ski resort is about 24 miles from the city of Santiago. You can even take a bus from Santiago to get to the resort. Its proximity and convenience to Chile's capital city makes it a popular resort for families. El Colorado is situated at 7970 feet above sea level. The resort has 18 lifts, which service 70 trails of varied terrain. Termas de Chillan is a ski resort and spa. Its natural thermal hot springs are a welcome change from the typical North American hot tub. The resort, which is situated at an elevation of 5249 feet, has a balanced mix of 30 percent beginner terrain, 40 percent intermediate and 30 percent advanced terrain, and boasts a discotheque, a casino, backcountry and cross-country skiing. Weekly package rates include lodging, breakfast, dinner, lift tickets, unlimited hot springs access and one night at the casino. 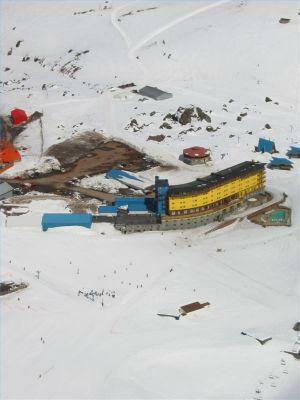 Valle Nevado is one of the largest ski resorts in the Southern Hemisphere. This modernized resort opened in 1988, and was modeled after the European ski resorts. Valle Nevado is situated at a base elevation of 9387 feet, so sea level visitors should acclimate before ascending to the mountain's summit. The resort's trails are divided into 14 percent beginner terrain, 30 percent intermediate, 42 percent advanced and 14 percent expert terrain. Few ski vacations can compare with a week in Portillo. The resort has a dedicated following, which includes members of the Austrian ski team, as well as testers for K2 skis. Portillo's all-inclusive weeks include lift tickets, three complete meals plus a late afternoon high tea. Meals are an elaborate affair. A suited host escorts you to your table. Check your ski boots at lunch hour and get back into your street shoes. Ski and boot checks are included in the price. Portillo has a disco, a basketball court, a movie theater and a lounge with free wifi. The resort is situated at 9350 feet above sea level, and has terrain for all levels of proficiency. Round-trip shuttle service to Portillo is available from the Santiago International Airport, or from your hotel in Santiago. The city, although a bit foggy and polluted, is worth a one or two day visit. A visit to a Chilean ski resort will be a memorable expereince. Be sure to bring your camera!